Cystic Fibrosis gene corrected in stem cells. A team at the University of Texas Medical School at Houston corrected the defective gene that causes cystic fibrosis in stem cells made from the skin of cystic fibrosis patients. In the long term the advance could make it possible to grow new lungs for patients with genes that match their own—with one life-saving exception—and therefore avoid immune rejection. But, the short-term outcome will be a model for the disease that provides tools for evaluating potential new drug therapies. The researchers made the genetic correction in the stem cells using the molecular scissors known as zing finger nucleases. Essentially they cut out the bad gene and pasted in the correct version. Stem cell researchers boost IVF. Given all the ethical issues raised in the early years of embryonic stem cell research it is nice to be able to report on work in the field that can boost the chances of creating a new life through in vitro fertilization (IVF). Building on earlier work at Stanford a CIRM-funded team there has developed a way to detect chromosome abnormalities in the embryo within 30 hours of fertilization. Chromosomal abnormalities account for a high percent of the 60 to 70 percent of implanted embryos that end up in miscarriage. But traditional methods can’t detect those chromosomal errors until day five or six and clinicians have found that embryos implant best three to four days post fertilization. This new technique should allow doctors to implant only the embryos most likely to survive. “A failed IVF attempt takes an emotional toll on a woman who is anticipating a pregnancy as well as a financial toll on families, with a single IVF treatment costing thousands and thousands of dollars per cycle. Our findings also bring hope to couples who are struggling to start a family and wish to avoid the selection and transfer of embryos with unknown or poor potential for implantation,” explained Shawn Chavez who led the team and has since moved to Oregon Health Sciences University. The study, which used recent advanced technology in non-invasive imaging, was described in a press release from Oregon. Fun TED-Ed video shows how to grow bone. Medical Daily published a story this week about a team that had released a TED-Ed video earlier this month on how to grow a replacement bone on the lab. The embedded video provides a great primer on how we normally grow and repair bone in our bodies and how that knowledge can inform efforts to grow bone in the lab. In particular, the story walks through a scenario of a patient with a bone defect too large for our normal repair mechanisms to patch up. It describes how scientist can take stem cells from fat, use 3D printers to mold a scaffold the exact shape of the defect, and culture the stem cells on the scaffold in the lab to create the needed bone. The video and story reflect the work of New York-based company EpiBone and its tissue engineer CEO Nina Tandon. Happy birthday Dolly (the sheep). 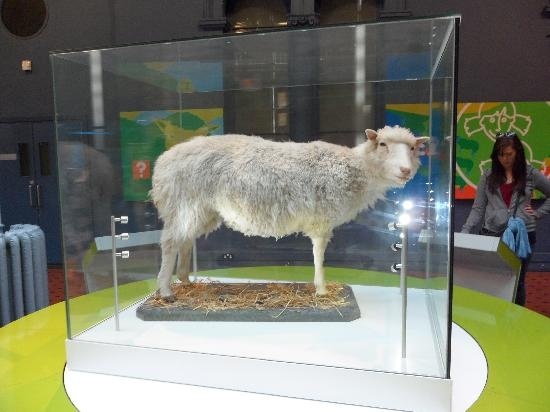 July 5 marked the 19th anniversary of the first cloned mammal, Dolly the sheep in Scotland. For fans of the history of science, MotherBoard gives a good brief history of the resulting kerfuffle and a reminder that Dolly was not very healthy and the procedure was not and is not ready to produce cloned human. Dolly’s taxidermied remains are in a museum in Scotland. She died after only six years, about half the normal life expectancy.